Peripheral Neuropathy continues to grow at an alarming pace in the U.S. Neuracel, designed to fight neuropathy, is one of the most effective peripheral neuropathy treatments that patients can make use of at the moment on http://www.neuracel.com. According to the latest numbers provided by the Neuropathy Association on http://goo.gl/3XOi0, an estimated 15-18 million people are suffering from diabetic neuropathy alone. The latest numbers added by the association just add to the intensity of the neuropathy issue, which has become a part of life for a large number of individuals situated in the United States. Worse yet, peripheral neuropathy continues to be left under-researched, with treatments limited to only managing the pain caused by its symptoms. Fortunately though, a remarkable new treatment for peripheral neuropathy by the name of Neuracel has been launched. The treatment is in the form of a capsule that is made of 100% natural ingredients, which, when consumed, can not only make the pain from neuropathy bearable, but also pave the way for significant repairs to the nervous system. 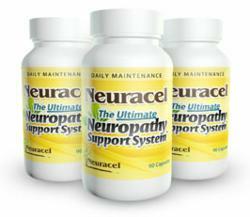 Thus, this is the reason why Neuracel is being called the Ultimate Neuropathy Support System. No more than a capsule, Neuracel has finally provided the answer that peripheral neuropathy patients have been searching for since years. While other treatments such as pain killers and antidepressants have existed for a long time, none of these are side-effect free and therefore cannot be consumed on a daily basis. Neuracel solves all the previous problems which were linked with pain killers. Since it is a completely natural answer to neuropathy, the capsules can be consumed daily. Thus, Neuracel has been created using only the best natural ingredients and the product has been launched in the market only after extensive research. The leading peripheral neuropathy treatment provider in the market, Neuracel can be sampled with a 2 week trial on https://neuracel.com/specialoffer.php. Patients can avail a discount if they wish to buy the capsules in bulk too. For package options and price quotes, visit https://neuracel.com.